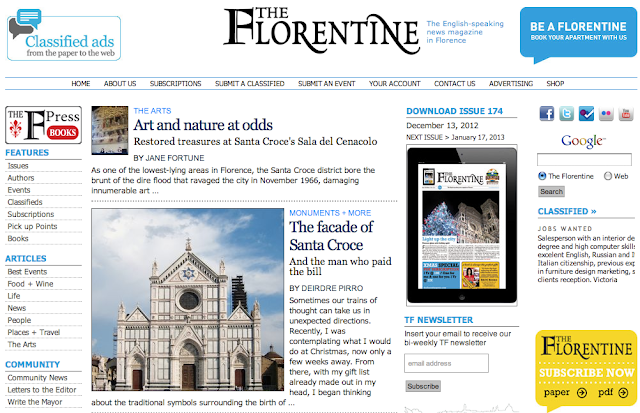 Over the past several months as Brandi and I have been preparing for our big move, I've tried to find as many articles, videos and any type of review about Florence as possible. Although we feel plenty comfortable learning about the city, the people, the culture etc. as we go, we're trying to gather as many resources of information and tips as possible. I suppose you can never be too prepared when moving across the world. At the same time, there are certain things that just need to be learned as we experience it. That's all part of the fun! There has been plenty of sleepless nights where Brandi wakes up to find me reading The Florentine at odd hours of the the night...or morning. The fact is, there's never a time when we aren't thinking about Italy. The Florentine is an english speaking monthly newsletter packed with all sorts of goodness about the city. Everything that they write about has definitely added some reassurance for us and excitement. We really don't know much about how the city functions and what it has to offer outside of the few days we spent there so this helps give us some insight on what else we can expect to do, see and eat. I've also found a two part video titled 'Florence In A Nutshell' that walks you through the city with explanations of the most popular sites to see depending on how much time you have available. For anyone planning on visiting us or just wants to see where we'll be for the next few years, I suggest checking these out as they've been very resourceful for us so far. It's also helped us find out about other places that are nearby and can make great weekend getaways. As awesome as Florence will be, there's a growing list of places we can't wait to visit. As the last few weeks for us here in the states wind down and we continue to check things off our massive 'Italy To-Do List,' we still pinch ourselves and wonder how we became so lucky. In other news, we are going to pick up the only other girl Brandi will ever allow into our marriage...my Honda Civic. Within the past 2 weeks, she's been on the receiving end of more attention than she's had for the past few years. With the exception of being detailed, she's pretty much ready to be stored safely while we're gone. Brandi and I have some pretty exciting plans for the near future (no, it doesn't involve having kids) and plan on continuing to share different tips and insight on how we've prepared for a trans-atlantic move. You never know, you may end up needing it one day. This time last year, moving to Florence was never even a possibility...now look! BSquared for lifers!! I love you my little Italian! I simply cannot wait for the big move!